What is a Community Literacy Lab? All you need to know about our community-based programme. Sessions are personalised for each child. Extra support out of school hours can make a huge difference to children struggling with literacy. As a charity, it is our mission to ensure every disadvantaged child receives the support they need. Like our Literacy Labs that happen during school times, our Community Literacy Labs are dedicated spaces where children who are struggling with literacy can receive one-to-one support from a specialist tutor. A Community Literacy Lab can happen pretty much anywhere – we currently have Community Literacy Labs at schools and in community centres (but we’re always open to new ideas!). They happen either after-school, on a Saturday morning, or on a Saturday afternoon. What happens at a Community Literacy Lab? The first time your child visits, an expert tutor will assess his or her individual literacy needs. A plan based upon these needs will then be created, with personalised targets to work towards. In each session, your child will spend 30 minutes working to address these needs with their tutor. They will also spend 30 minutes with a volunteer, reading stories and playing games. What makes our Community Literacy Lab different from other kinds of literacy support? In our Labs, your child will always work one-to-one with a tutor. We know that this is the most effective way to address children’s individual needs. The bond that develops through working one-to-one paves the way for learning. 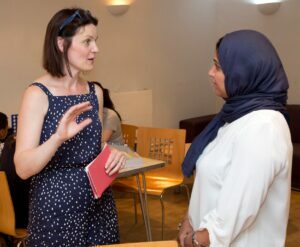 Using a phonics-based approach, our tutors work hard to make sessions engaging and interesting, drawing on high-quality teaching materials and multi-sensory techniques. Our tutors are more than happy to discuss your child’s learning with you. Will my child always work with the same tutor? We try to keep tutors as consistent as possible. However, because not all our Community Literacy Lab tutors are available to work every Saturday, we cannot guarantee your child will work with the same tutor each time. Our tutors will always make notes about how your child got on with the learning which can be shared with other tutors to ensure any subsequent sessions are pitched appropriately. 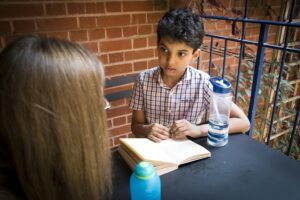 Will I be able to discuss my child’s learning with their tutor? Yes, there is a dedicated time at the end of your child’s session when you will be able to talk to their tutor, to find out about their learning and address any queries you may have. Key to our approach is working in partnership with parents – we know that this is how children’s learning is supported best. Why do you include playing games? Playing games adds an element of fun to help keep motivation high. We find this especially helpful for our Community Literacy Labs as they take place after school and on Saturdays, outside formal learning times when children need to re-charge. Playing games also helps to develop children’s language, strategic thinking and social skills. 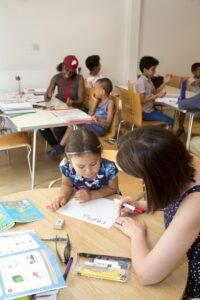 Our Community Literacy Labs cost £5 per child per session for families in need, or £15 per child per session at the standard rate. If cost is an issue for you, please talk to us. Who can come to a Community Literacy Lab? Any child can come to one of our Community Literacy Labs provided they have a literacy need. Our initial assessment will ascertain their level of need and whether we can help. We can support children from 5 to 14. Does my child need to come every week? Yes, we ask you to commit to bringing your child every week for 12 sessions. This is the minimum length of time needed for us to deeply impact your child’s learning. If your child is unable to make a session, we ask that you notify us. As there is a high demand for places, if your child does not attend for two consecutive sessions and you do not notify us, we may have to give their place away. Do I need to book a place in advance? Please contact us on 020 7740 1008 or sign up via our online form. We will be able to advise you of availability. Where and when do your Community Literacy Labs take place? "Our daughter really looks forward to coming along each week. On Friday she always reminds us that tomorrow it will be the Literacy Lab."